It is best to go between October and April, because before that is likely to encounter snow and very cold in the higher sectors of the trek. It is important to start early, as during the day can become very hot (I recommend going out with about 2 liters of water in the bag, because the next water source will find surely is about 3 hours above ). Before leaving, notify the office of CONAF the route, which serves to receive information about this. The starting point is the CONAF office, going through a gate behind it, through grazing land is being reforested with native forest. After walking about 30 minutes long climb, one passes through an area that burned in January 2008 for a "brilliant" that occurred to him and throw your cigarette smoke. After a 20 minute walk (always go straight up and not take some of the smaller trails in the area has CONAF) one arrives at a small esplanade. Here is a house built by CONAF observation, a model that will be repeated 40 minutes later on the road in a clearing dominated by a large cypress tree. A few steps away lies a mat in the hottest months is usually dry. Follow the path that keeps going up, yet surrounded by a forest dominated by ñirres and some cypress. After an hour the landscape start to change, leaving the forest entering an area covered by bushes and the soil is composed of small stones as if an avalanche had happened some years ago. It is in this place that can refill your water bottles. After a few minutes walk definitely opens Indian Valley ñirre covered by scrub, perceiving the Cerro Tres Puntas and Salto del Indio. About 40 minutes later one above CONAF Refuge and Camping El Bolson, where several campsites and a good stream. From this place has a good overview of the Devil Fang. To this place, with fitness and an appropriate load, are about 4 hours. If you left early, I recommend continuing on, otherwise the second day will be very long. Shelter From the road climbs and passes through a first scrub ñirres sector. In this sector we must be careful because it is easy to lose the route (there are several spray-painted orange arrows pointing toward the river, NOT to follow). Among the options that you can "lose" is delivered directly to the Salto del Indio. After 20 minutes you come out of this first ñirres sector, following the path (in this area is clear) to enter a plain composed of sand and rocks swept away by the river and landslides in the hills north side of the road. About 10 minutes beyond one is empty with a sign, whose information was erased by the sun and snow. You can see a new ñirres sector, to be taken through the center of it. There is a 'square rock', almost like a table in the middle of a lawn (mowed religiously for horses and cows that roam), with the river right side. From this stone go straight until it touched the wall and follow ñirres left. After a few yards you will find the last miracle in this maze of thick ñirres (I lost myself in this industry when I did this trek). I recommend not taking it on the left side (above the line of the ñirres) or right (by river), why not see where the trail continues, losing the starting point of the hill to the Laguna de las Animas. After emerging from this thicket of ñirres the road passes through the bed of an estuary, reaching another bush, less dense than the last. 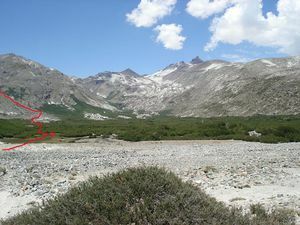 From the dry bed of the stream, facing Cerro Tres Puntas, clinging to the hillside which is toward the northeast, will see a sign indicating "Laguna de las Animas". From the sign, should take about 60 to 90 minutes to climb the hill (the path is clear), which has a couple of breaks with good views of the valley. In the saddle, may run a little wind. The last part of the day is from the saddle, down to the Laguna de las Animas, a remarkable Andean lagoon with white sand beaches that invite a dip stick. To this place, from the Bolson should be 2 to 3 hours depending on the physical condition and accumulated fatigue of the day. The trail starts from the south east of the pond, covered up by some sectors in certain seasons of flowers and grass. About 30 to 40 minutes after you leave you will come to a small mat that crosses a large meadow, while at high speed down the slope. After this meadow and one 30 minutes later, they reach the top of a hill, where one stream debiese spotted a wide, but shallow. If you or another should fill their bottles, as when crossing the saddle will not have water for a long time. From this point, the trail starts to pick up the slope, pointing toward the north. The trail will continue through large fields of volcanic pebble nearly white, a sort of pumice stone, stones stained dark brown. Walk down this pebble can become tiresome (which will be the scene for several hours walk), as one sinks into it and reflects light and solar radiation. It should take about an hour to get to portezuelo, where he will have a unique panorama of Laguna Mondaca and glaciers Peteroa Volcano. Portezuelo fall of always following the hillsides who will be his right side, following the path (the line is noted and in some areas there are small stone monoliths), without suggesting in any way to Laguna Mondaca. The slope in some areas may become pronounced. After about 2 hours to reach a stream, which will seem a piece of paradise in this volcanic desert as the shore is covered with flowers of various colors. Rest in this place and hidrátense. From here you should go (again with the pleasant volcanic stones) for about 90 to 120 minutes that can become tiring, when finally they headed south to the valley of the Estero del Volcan, which will have a panoramic Descabezado Volcano. From this point is pure descent (in some places rather steep, narrow sections) until you reach a small plain, dominated by a couple of rocks the size of a 3 story house. Hit the estuary, but heading south along the trail. After 10 minutes you can see clouds of steam arising from the hot springs. The springs are worth all the effort on this day. The floor of the tent will be hot (the mat need not go cold). There are 4 natural pools and putting a worthy one bathroom recomponedor be combined with the icy waters of the estuary. Be careful, as there are 2 that have water at a temperature very high, reaching burn. This day is to get to Laguna Mondaca. Unfortunately due to physical problems with my partner decided not to add the physical burden of another day of walking. What we said other people who were in the bathhouse, is that they were about 7 hours walking among the whole trip, it would have to add the time you're in Laguna. If someone did this part of the trek, supplement. Back on the road to Laguna Las Animas. Leave early to avoid the heat in the field of volcanic stones, while one goes to portezuelo. Same way to English Park. Extremely relaxed, that is pure descent. A good step are as 3 to 4 hours from the lagoon to the office of CONAF. Warn the latest trip to the rangers. Route Waypoints, taken from Schubert and Sieber. To download the file right-click and then select "Save file as" (IE) or "Save link as" (Firefox, Chrome). By trying to open it directly, some browsers will show the raw code with the coordinates.